Missionary boarding schools are unlike any other institution to a degree that would boggle your mind if you were not ever in one. Perhaps the most colorful, and sometimes painful, aspect is the "keepers". They have other titles of course, but they are the missionary staff and national workers who rule and reign over the inmates, those dear loving missionary brats. Most missionary kids have some bad feelings about some staff member, but life is like that, right? I have known missionaries who were troubling as missionary boarding school staff, but when they later worked with the African church, they were loved and served with distinction. It is wrong for mission leaders to divert someone from their calling just because there is an alleged "emergency need." If you merely want to get the warm fuzzies from "serving God," do NOT ever find yourself on staff at a missionary kids' boarding school. Missionary kids are rather high strung types. Their parents would never have left the simplicity and security of the "home land" to go around the world if they were the timid and regressive sort. So, this sort of people breed their kind, and if you are on staff at a missionary boarding school, you will be dealing with some of the most creative brats on earth. The testing of being called on to love and guide these young people is a burden ONLY for those who serve 100% out of faithfulness to Christ himself. But, serving in a missionary boarding school has rich rewards for those who are truly called to that work. There are the little kids who miss Dad and Mom that need your hugs-- there are the young men and ladies who are having to grow up and become adults without a traditionally biblical home. Now days there are national youth in missionary boarding schools. This is due to national Christians and politicians wanting to use the missionary boarding school as a high level prep school so that their kids can go on to college in the USA or Europe. But, you may be used of God to send such a national kid in the direction of zeal for the Lord Jesus Christ and service to his Church. That kid could one day be a future member of Parliament or business tycoon in the African nation. If you wish to serve in such a setting, you better be VERY balanced and mature in the faith. If you are a trendy diddle head or spiritual space cadet, you will be devoured and maybe return to the homeland whipped. A serious issue is the international make up of a missionary boarding school. The missionaries in any particular MK's school come from the UK, Europe, Korea, the USA, South Africa, Australia, New Zealand, and other nations. Missionary boarding schools take students from many mission boards, and this causes some tension due to doctrinal differences which must be juggled about without offending anyone. If you don't believe anything, you will not be an offense, and God will spew you out of his mouth as a Laodicean fake. If you have strong convictions, you will be frustrated having to back off in some doctrinal areas. "Tribulation worketh patience" will be your motto. National Christians are hired to do various tasks to keep life in order. They are usually sought out from the local church where church leaders help to make sure these workers are godly and safe to have on the campus. In the school I attended, Rift Valley Academy, the African workers were doing the cooking, guarding, laundry, grounds keeping, and other tasks that were essential. Some missionary kids considered the African workers as their friends, while others treated them as dumb servants. The mission and staff made little effort to encourage us to respect them. My parents' standards in this area prevailed though, and I have some very special memories of the African help. I begin with them in the list below. Now, having gotten some perspective, I want to just wander about in my memories and introduce you to some missionary staff and African workers I knew as a missionary kid. I believe it will be of instructional value to any prospective missionary. If you would like to peruse the web site of Rift Valley Academy, go here, but understand that it is a totally changed school from the day I went there in 1954 through 1961. Also, see a Video of the school recruiting staff. Nahashon as the head African cook, mpishi, of the school. He was Kikuyu of course. He had been the chef at the Bell Inn in Nakuru in past years, and we heard that he was very well liked by the settlers for his art of serving up European food. He was also a born again Christian and church leader. He wanted to work nearer his home area of Kijabe, so he had applied for the job of head cook at Rift Valley Academy. Nahashon did not have much in resources to work with, like at the Bell Inn. So, he had to be creative. The missionary lady in charge of the kitchen and food service would plan the menu, and the African cooks had to make it work. Nahashon's Sunday dinner was splendid. The roast beef was the high point. I would sneak into the kitchen after Sunday morning services, and Nahashon would give me the first cut of crusty meat on the end of the roast. It was hot and full of fat, and that made my day. Sunday evening we had a very special meal. There were cold cuts of left over roast beef along with slices of ham. There was potato salad and finger vegetables. This was the only meal when hot chocolate was served, and Mrs. Senoff (Ma Snuff) introduced ice cream. This rather classy meal was the result of skimping all through the week, not in food quantity, but in quality. There were even terrifying experiments with steak and kidney pie and cheese on toast by Mrs. Hodson. To her English mind this was perfectly good food. To us kids it was like being gagged on the wrong parts of the animal. Nahashon had to try to make the skimping palatable, and he did well, if he was left alone. Now, Nahashon's toast was a serious fault. The toast was made by laying it on charcoal blazers, but it was then layered in a big sufaria (huge pot) with a cloth over the top. The result was that the toast got thoroughly soggy and limp. The oatmeal was awful also, but that was because it was not cleaned well enough at the mills and it had lots of chaff in it. This was claimed to be the toe nails of the cooks by certain cynics. There were other workers in the kitchen (Wilfred and Mwangi are all I recall), and I was on good terms with them all. Some missionary kids never cared for the Africans, and some never learned an African language. I always wanted to speak Swahili better than I did, so I would talk and chatter in the kitchen in the afternoon for maybe half and hour, and the cooks would help me with vocabulary. In turn for various culinary favors I received, I kept the cooks in razor blades. An African can hold a double edged razor blade between his fingers and thumb in a way that controls it, and they can shave with it. Terrifying to watch, but it works. I also had a sort of underground connection with several African workers, and the cooks would let me know who to avoid and who was troublesome. Inside information is often worthless, but it sure makes you feel important. Now, here is a gem of a fellow. He was bandy legged and a bit gaunt, but he was a sweet fellow. You need to understand that the Kikuyu tribe, who lived around our school, walked up and down the mountain sides all their life, and they were all bandy legged and hardened by the high altitude. They were always on guard for wild animals along the path also. And, the Kikuyu were also notorious as the most treacherous tribe in East Africa. If you were their friend, you were in very good company, but if they did not like you, you would do well to move elsewhere soon. Somehow, Betiru and I hit it off. There is a weird thing about missionary kids, for they can become a sort of mascot of an African adult in a way I have never totally understood. Betiru was accused of shirking at times, but Herb Downing valued him for his plodding faithfulness. Betiru would load all the wood boxes. Kiambogo building, the main building of the school, had about ten fire places along the middle which warmed us on cold days. We were at 7000 feet altitude, and it could get cold in the dry season. Betiru would bring a wheel barrel around to the window where I did math and other studies, and he loaded the wood box just outside the window next to my desk. I had an arrangement that Betiru would bring along a banana and slip it through a broken window next to me. The teacher never caught me, and the banana was the insipid high altitude variety and green even when it was ripe, but the thrill of the scam was just what a fourteen year old brat needs to feel like he has the inside track on life. I believe Betiru had mastered the art of hanging doors from Herb Downing, the principal, and that may have saved him from being fired for being caught several times in a dark study in a closet working on cutting zzzz's. This fellow had the job of taking a donkey cart several miles up to the top of the hill above the school to a British White settler's farm. The donkey cart was the old two wheeled sort, that was invented many years before, when roads were bad and autos were unreliable. Shege would load several huge aluminum milk cans on the cart and set off early in the morning. By mid day he was back with the milk. The road was steep in places, so it is a wonder he never lost the thing. He was the sort of fellow who acted simple and frowned while you were talking to him, and suddenly he would twist your words upside down, grin, and walk off. It was a challenge to try to get one up on him. He was not so graciously nick named "sheg a leg," as in shake a leg. This old fellow had a rather well developed but poorly trimmed beard, and he wore a large black felt hat, cocked off to one side. He looked like a sea pirate in early retirement. In fact, some of the kids were frightened of him. Phinehas was hard to talk with because his Swahili was almost as bad as mine, but we did not let that prevent us from faking an intelligent conversation regularly. Salmoni (Solomon) was the head launder over the African crew. 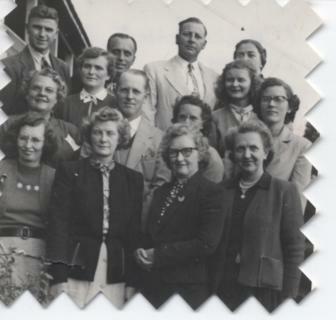 Vivian Hollenbech was the missionary staff lady over them. She had help from some of the student girls when the work was too much, and the girls got paid for this. The school let us students work for small change which we then could use in the "canteen" on Friday to buy candy, pop, and later ice cream. Laundry was delivered to the open window in laundry bags we all had. The condition of the laundry when delivered could be utterly revolting. The worst of it was the red Kikuyu clay soil. During the rainy season we all played with delight in the mud. We had mud fights on the soccer field, we rode bikes in improvised slaloms up the sloping hills, and we slid down the cuts in the railroad right of way above the school. In fact, we had slides well worn into these rail cuts through he hills, and when it was raining, we would rush up the hill and have a slide. So, the laundry water in the washing machines was red and ugly, and I recall there having to be several tries made to finally get our khakis looking the right shade of color. I never heard of the Africans complaining. They had an African worker who tried to appropriate some of our clothing, but when her kids turned up in it elsewhere on the mission station, she lost her job and ended up on church discipline I gather. On Kijabe mission station there were many schools, a printing press, hospital, and the headquarters for almost every department of the mission in Kenya. It was like a small city, and they eventually had to have street signs and a fire department. It covered 700 acres in my day long ago. Well, there was a low level but rather fierce competitive spirit between us boys and the boys in the African school. There was no way those African boys wanted to be submissive to us small bwanas, and we were determined to prove we were their superior. Neither of us ever won, but we had some interesting times trying. I recall one "game" took place across a small valley in which we used our sling shots and fired yellow kaffir apples at the African boys, and they in turn packed mud balls and ran up at close range to us and smashed us soundly. Both side knew they had not won anything, but it made for some exciting talk about shots that landed home. There was a sort of unspoken understanding that we should not do anyone any permanent harm, so if the staff ever knew about it, they looked the other way. I suppose the African head master did the same. The school board was made up of missionaries who did not work at the school but were assigned to Kijabe station or nearby. Doc Probst was the chairman of the school board. He was an engineer, a medical doctor, and a very practical man. He was no easily perturbed by panic stricken missionary teachers, but he was demanding of righteousness. The thing in which we feared Doc Probst the most was his attitude toward our sling shot forays into the forest around the mission station. We were under the strictest limits to only shoot at varmints, never game birds or animals. Some of us had traps to catch genet cats and weasels. Some trapped rabbits, which was my only claim to fame. But some went beyond the law. One day I was on the lower end of the station in the woods hiking alone, and I heard hollering and roaring coming. I stood still and waited, and a bush buck antelope came charging along. It was a big one, about the size of a large US deer. Right behind it was a mob of boys with sling shots loading, running, and firing. They used ball bearings for this hunting. Well, the bush buck, to my amazement, could not escape the mad boys' rush, and they killed it. After they bled it, they about panicked, for they knew they were essentially outlaws. They cut some meat cuts off the animal and went back to the dorm, and in the process of cooking it, the word got to Doc Probst, and he went ballistic. I was told that the meeting he had with the boys made a lasting impression on them, possibly in the anatomy as much as in the soul, and I did not ask questions. Those boys were mad, scared, and I think a bit relieved. They had put their sin behind them, and that might be putting it literally, and it was decided not to call in the Kenya Game Department on the matter. Close call. I was glad for once that I had declined to participate. I felt like a wimp at first, but my Dad was a stickler for keeping game laws, and I would die if he had heard I was a rabid game poacher. What a sweet man, and what a manly man. Pa Giddings was the son of a musical father, but he ended up at RVA teaching math, indeed, trigonometry, solid geometry, and calculus. I had been badly used by the missionary teaching us algebra, and I had a bad attitude toward the art of x plus y. In fact, my major was not at all in that direction, for I was majoring in Diddling, with a minor in Limited Attention Span. So, algebra was rather demanding on me and cut in on my more urgent avocations. Well, Pa Giddings was a match for my attitude problem. Though I had not done well in algebra, he took it as a challenge to drag me bodily though the limitless spaces of solid geometry and trigonometry. He must have caught onto my fascination with the slide rule, with the challenge of proofs and logic, and with the inspiring thought of a line starting out on a curve into space but never again meeting itself. I still sit and ponder this mathematical anomaly at times. I loved to go ahead in the book and find a shorter version of a theorem and proof. He would grin, scold me a bit about sneaking ahead, and help me do it the long way. Years later I realized that he was allowing some of this to whet my appetite for the discipline. Herbert Downing was born in 1905, the first missionary kid born in East Africa. His father, KL Downing, was a true pioneer missionary. After growing up in Africa, Herbert Downing went back to the USA to college, and his studies prepared him to return to Africa with a teaching degree. Herbert was a rather serious Calvinist Presbyterian, and his serious look at life was his most powerful tool. This is because as Herb Downing, known as Pa Herb, arrived in Kenya, the Africa Inland Mission was having a bit of an in-house war over their missionary kids' school, RVA, and whether it would be a complete academic prep school for college or a reading and mathematics school along the lines of the Amish schools in the USA. Many leaders thought that too much education was worldly. So, Pa Herb took over the direction of RVA and began a steady push in subtle and quiet fashion to press RVA into a very academic environment. Pa Herb was fluent in both Kikuyu and Swahili due to his youthful days growing up in the Kenya Highlands. This asset kept the leaders from moving him out of his leadership of the school, for Pa Herb could motivate and love the African workers like no one else. Pa Herb taught me to enjoy psychology. In RVA, if you just could not deal with a subject, you were permitted to take an elective. But, the electives were intentionally made to be very hard subjects so that they would be used to pursue an academic path upward rather than to evade hard work. There was no auto shop and basket weaving to baby sit the diddlers. My nemesis was Latin-- I learn languages best by using them, and Caesar had unfortunately expired well before my schooling days and was not on hand to tutor my feeble mind. I could see no reason learning to converse with a fellow who was long dead and drawing much criticism in the press. General psychology was one of the electives from which I could choose, so I signed up in order to escape from Hic Haec Hoc. Pa Herb liked psychology, and he taught the class and made it live. I later took it as a minor in college. So, he DID make a contribution in my life. I realized years later that Pa Herb was a teacher at heart and enjoyed teaching immensely. But, as with so many staff at RVA, he was plugged into a hole that needed filling, which in his case was principal and promoter of higher education ideals. I believe we never got to know Pa Herb like we could have if he had been a teacher more of the time. One thing that came through though was that Pa Herb did not negotiate his convictions-- they lasted a lifetime. What an interesting man. Stocky and rather Dutch, he was not of the usual dark forest temperament of some Hollanders from Michigan. Pa Holly and his wife came to RVA to teach music. All missionaries have something they plan to do for the Lord when they arrive on the field. But, when they arrive, whatever emergency is transpiring due to another missionary dying or retiring, the new missionary will be "helped" to learn that God wants him to replace the missing missionary. This is a highly suspect way to play with the will of God of course, but missions today is all about management and plugging holes, not about the will of God. Pa and Ma Holly arrived at RVA ready to put together choirs and bands and music lessons. The school board agreed that this is what they would do, and the school board asked them to also manage the food service, run the laundry, and be house parents for the boys from First Grade through Eighth Grade. The work load was way to big, but, they loved the kids, they loved their work. Ma Holly really did a great job in the kitchen. The food was quite good under her tenure, though she had trouble learning to crack the whip. We all had to take turns washing the dishes, setting the table, and serving. The only way to make this efficient is to drive the beggars mercilessly, or they will not get anything done right. She learned. Ma and Pa Holly also were great with the little boys. They felt for them because their Daddies and Mommies were far away, and many of the little boys were home sick. A really home sick little guy might even be taken into their apartment to be held so he could cry without the other boys laughing at him. The older boys in grades 7 through 8 were hard on the Hollenbechs. They did not know as much about dealing with them, but they tried, and we knew they loved us. Pa Holly did an exceptional job of making music come out of the most unlikely kids, or at least out of a tube of brass put up to their lips. His band did famous things, and I had the joy of playing the trumpet in the marching band. I got flustered and missed half the notes on any piece with more than three flats, but I faked it, and I was fantastic at "oblique right" and "about face" without being impaled by the trombone players. Pa Holly would take a group of singing and band kids off in borrowed vehicles every Sunday to play and sing in African churches at some distance. This gave these kids something to do for the Lord and helped them grow up in Christ. Pa Holly was not thought of as particularly brave until one day during the Mau Mau emergency. The Mau Mau uprising was a time when the African Kikuyu tribe, that is, a portion of it, tried to force the British Government to leave Kenya. Our school was in the very heart of the "Emergency" area. We lived behind barbed wire fences, with punji sticks, spot lights at night, and sand bag bunkers. There was a platoon of the very famous, and very deadly, King's African Rifles guarding us. This was all African with a highly decorated African Luo Sergeant Major who had earned dozens of honors in Burma and was a member of the Queen's Body Guard. There were two British Lieutenants in charge. One day the big bell rang at an odd hour, and that meant a Mau May alert. Mau Mau terrorists had been seen in the area, and we all were taught to go at once inside the main building and go upstairs. We were supposed to keep our heads down in case gun fire started. Fat chance! We boys could not resist watching to see if there was any action. On one particular day, after the alarm bell rang, the African guards were in the sand bag bunkers with their .303s ready, and the Bren guns were laid out and ready. But, yonder, who is that running along the hedge? Pa Holly! He had heard that a Mau Mau had been seen lurking around a large cedar hedge, so he got his heavy Masaii spear which he kept for self-defense, and he was running along the fence poking the spear into the fence to see if he could scare out a Mau Mau to be arrested by the African soldiers who guarded us. We boys were in awe. Pa Holly was not the type. You would never have guessed he would do a thing like that. Well, when the big bell rang signaling that the alert was over, we came out or our rooms and talked for hours about Pa Holly. We speculated that he could have been killed if a real Mau Mau had been in the area, but we were in awe of this man in a new way. When a man shows a fearless spirit at the right time, he is the ultimate inspiration. May God give us such fearless men in defense of the Lord's Church. I have not seen much of it lately. We never knew what Liberal people the Simmons should have been. They were Episcopalian, but no one ever learned this, possibly not even the mission leaders. But, the Simmons had a true faith in Jesus Christ and talked about it. Ma Simmons took over the laundry so Ma Holly would not go nuts from over work. Ma Simmons took any ugly or crazy event in the best spirit and knew how to find something funny in almost any troubling moment. The laundry was a great place to learn patience. The Highlands of Kenya are red clay, and I mean redder than Oklahoma red clay. We kids would play violently in many games and ventures, and the most violent activities seemed to be during the rainy season. We had a game, if that is a possible definition, in which we divided us boys into two sides, and we would then line up on opposite sides of the soccer field and make mud clods and throw them at each other. The only rule was that you could not embed a rock in the mud clod. Hey, we were careful, OK? Well, after a mud clod fight one day, we would get a couple of bikes the next afternoon, and we would ride up a path coming down the long hill behind the school. This path soon became slick as ice, and every ride ended with a fall in the red wet clay. After two afternoons of rolling in the mud, we would pitch our clothes into the laundry bag in the closet, and on Saturday we would take our bag of laundry around to the laundry room to be washed. Ma Simmons had several Africans working for her, and the magician was Solimoni. He somehow managed to extract that red clay from our khaki uniforms and return them to us clean as a new model. We would go around to the laundry and talk to Ma Simmons about our troubles. She was a fantastic listener, and not many of the staff wanted to listen to immature brats gripe and groan about their youthful sorrows. One day I was telling Ma Simmons how utterly disgusting one of the other staff was to us kids. Ma Simmons listened patiently. I think she knew that staff member was indeed a heartless person. After I had vented a while, Ma Simmons asked a question, "What do you think so and so would be like if they were not born again?" That stopped me dead. I thought for a long while, and I told her they would be terrible. Ma Simmons then told me, "Maybe you should thank the Lord they ARE born again, right?" I agreed, and I felt a lot better. I recall even trying to figure out what made the ugly staff member so ornery, and that set me off in a more constructive direction. Wise people don't join in when the griping is going, but the really wise ones redirect the gripers so that they start looking for reasons to justify rather than reasons to condemn. This is the highest order of wisdom, for our God, by Jesus Christ, made the ultimate sacrifice to find a way to justify us. I hope to add more of my keepers to this page. I invite RVA alumni to send in contributions also.